Welcome to my interview with author Susan Hood. This is part of an ongoing “5 Questions” series, where the discussion revolves around one specific book. On a weekly basis, we’ll be hearing from Matthew McElligott, Jessica Olien, Lizzy Rockwell, Matthew Phalen London Ladd, Matthew Cordell, and more. That’s a lot of Matthews! This is a gift that I’m giving myself, forcing myself to spend time and thought on some terrific books. Hopefully I’ll learn something along the way. Oh, look. Here comes Susan Hood up my walkway. Not a bad view out my front door, you think? Greetings, Susan. Tell us about finding this story. Did you immediately see it as a potential picture book? Hi, Jimmy. Thanks for having me. I can’t take credit for discovering the Recycled Orchestra. All kudos go to the late great Bob Simon who did a fantastic story about it on 60 Minutes and to my editor Christian Trimmer who saw the segment and the story’s potential for a picture book. I’m so grateful I’m the author who got to write it. Looking into the story, there was a lot of press about Favio Chávez, the conductor of the orchestra. But for a picture book, I wanted to shift the focus and talk to a kid in the orchestra. That’s how I decided it was Ada’s story I wanted to write. This book is such an accomplishment. I’m in awe of what you’ve done. Big respect. I mean, wow, you’ve done it; you made a great, great book. I’m actually standing up and clapping right now, while typing with my toes. Ha! I always knew you were a man of many talents. (The secret to writing so many books?) But seriously, thank you. As I’ve told you, writing this book was one of the best experiences of my life. I fell in love with these kids and I guess it shows. Yes, your affection for this story comes through loud and clear. 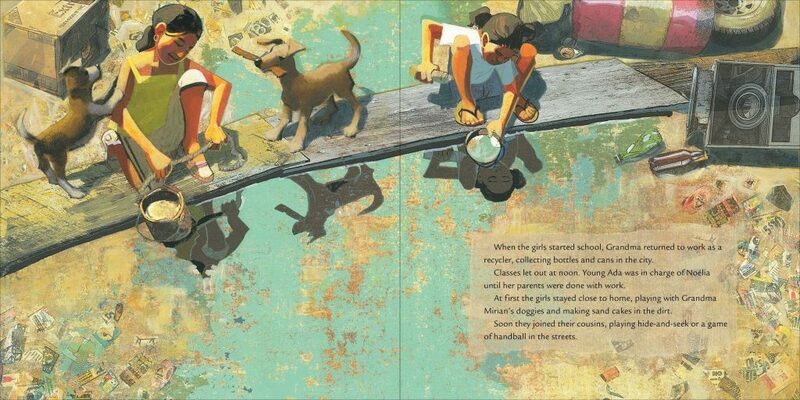 It’s such a challenge to take a story this big -– with so much depth and detail – and find a way to condense it into a picture book format without losing the heart and soul. What a struggle that must have been. How did you even begin? Sometimes writers will find a sentence, or an image, or even a word that sort of lets them enter the story through a side door. Does that make any sense to you? 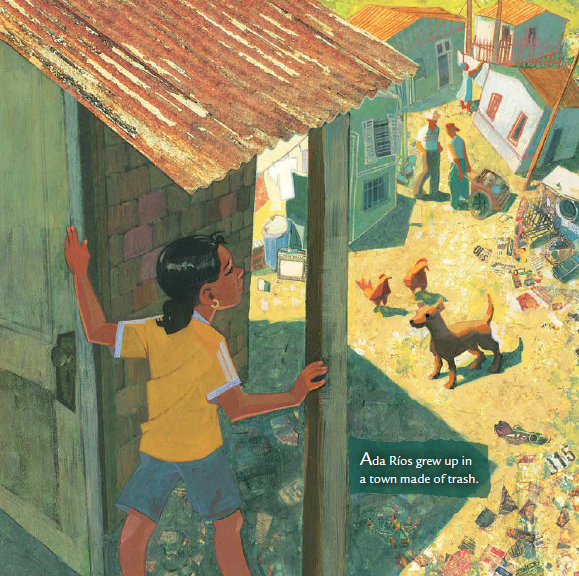 I wrote many, many drafts of this book, but the first sentence was always: “Ada Ríos grew up in a town made of trash.” The kid in me knew that that was a killer statement; just imagine growing up in a place where everything in your life — houses, beds, toys, clothing — comes from other people’s trash. And then imagine taking that trash and transforming it into music. Pure magic. Obviously, for Ada’s Violin, there are real people involved. It’s a true story. So that had to be an added weight, this huge responsibility to do justice to their story. Tell us about your research, and your interactions with Ada in particular. Yes, I worked hard to get it right. In the beginning, I decided I could tell this story in one of two ways: the easy way and the hard way. The easy way: use the news reports as background, make up a kid, and tell a story “based on a true story.” But why would I make anything up when the true story is so astonishing? Um, wild guess, but: because it was the easy way? No, I knew I had to do it the hard way: find an actual kid, do interviews, and tell a true story. Yeah, I suppose that also works. The obstacles seemed daunting. 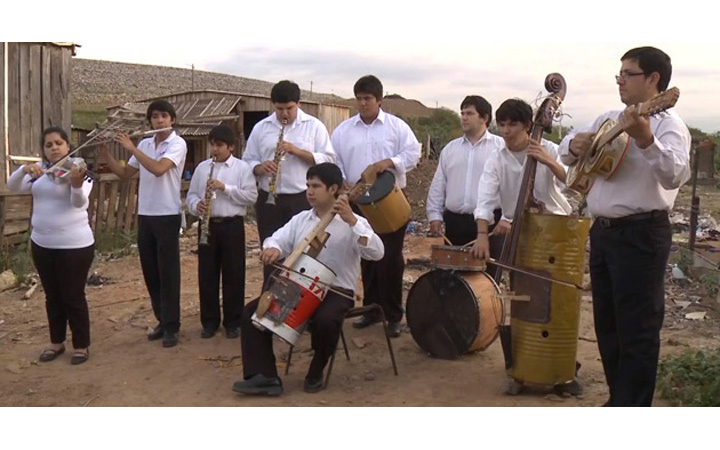 I couldn’t afford to go to Paraguay; Cateura has no postal system and little electricity; I don’t speak Spanish and no one in the orchestra speaks English. When I talk to kids about the story, I tell them, “Don’t be afraid to ask for help.” I hired a translator and asked 60 Minutes if they could put me in touch with Favio Chávez. The producers loved the idea of a picture book and were incredibly generous and supportive. It turned out that Favio had access to email and Skype so I did several rounds of interviews with him and later Ada online. The tricky part was that they were on tour so much, it might be months between questions and answers. My editor was extremely understanding about extending deadlines. For picture book authors, we write the words and then we wait, and wait, and wait. Then there’s always that remarkable, heart-in-your-throat moment when the art arrives. Tell us about your reaction to seeing Sally Wern Comport’s work for the first time. Jaw on the floor! Sally sent us color sketches and I was stunned at her use of found objects and mixed media that so perfectly mirrored the bits and pieces of landfill, the houses, the recycled instruments. And as hope comes to Cateura, her palette moves from dark shadows to light-infused scenes of gorgeous color, sprinkled with musical notes that take to the sky. I’m still in awe of what she’s accomplished. I love every blessed inch of this book. But I’m especially moved — transported — by a spread two-thirds of the way through the story. The visual focus is tight on Ada playing her violin. 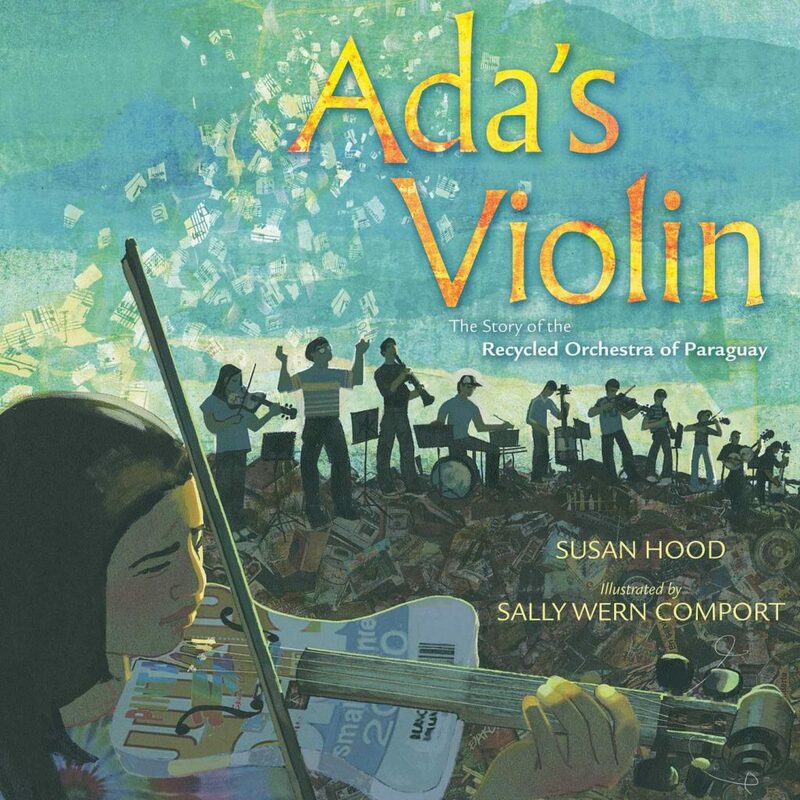 The words are few and absolutely perfect: “With her violin, Ada could close her eyes and imagine a different life. She could soar on the high, bright, bittersweet notes to a place far away. She could be who she was meant to be.” The language is clear and direct, but also there’s the uplift of that poetic phrase -– “the high, bright, bittersweet notes” –- where the sentence soars right along with Ada. And we, as readers, soar with you. That right there is some fine writing, Susan. That makes me so happy because that’s my favorite spread in the book, too. The art is simply spectacular. I listened to a lot of violin music as I was writing and it was that word “bittersweet” that rang true, both in the sound of the music and in Ada’s thoughts of leaving Cateura. While her town is undeniably “a noisy, stinking, sweltering slum,” it’s where Ada’s friends and family are, where she’s grown up. It’s the only home she has ever known. I understand that you worked at “Sesame Street.” I’ve always wondered: Was Oscar really that grouchy? Or was that only when the cameras were rolling? Funny that I’ve gone from Oscar’s trash can to Ada’s landfill. As Carroll Spinney has said (and I’m paraphrasing) the only thing that kept him sane playing Big Bird was that he got to play Oscar, too. So yes, he was always grouchy…unless he was revelling in trash. And when Cookie Monster went on the Paleo Diet, that had to cause tensions on the set, yes? 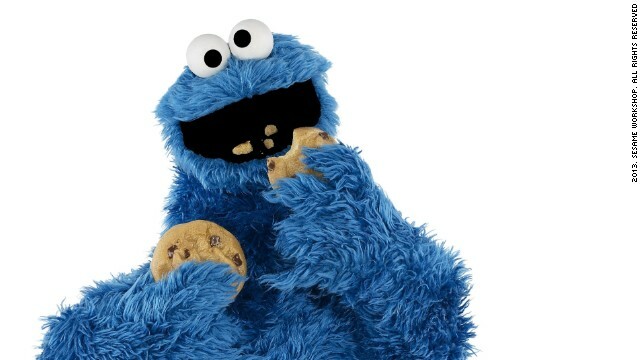 Cookie Monster, during happier times. It was brutal! No cookies, no milk. An experience like the one you had at Sesame Street must have had a profound impact on your work. What do you think was your single, great takeaway from those years? You’re right. We still need diverse books, but Sesame Street has been nurturing diversity since 1969. There’s a great big world out there and that’s always informed what I want to write about. Another takeaway for me was the idea of layering. Sesame Street jokes and stories work 100 percent for little kids and yet there’s an extra layer for their parents, which encourages families to watch together. A win-win for everyone. The best picture books give that same 110 percent. And finally, Kermit and friends taught me the exquisite joy of making a little kid laugh. 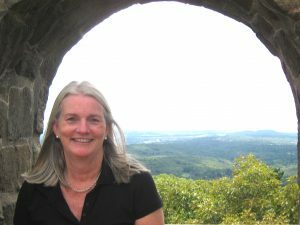 SUSAN HOOD is the author of Spike, the Mixed-Up Monster; Rooting for You; Leaps and Bounce; Mission: New Baby, and many others. Her new book, The Fix-It Man, will soon be published. Susan keeps a tidy blog that’s easy to find.